April 15, 2019 The wife and I had been itching for a day in Monterey. 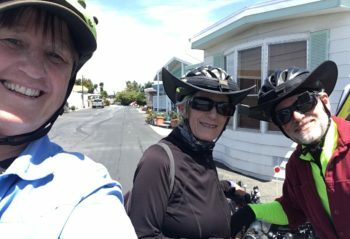 I contacted Our Good Friends Jack and Janet (TM) to see if they would be around for a CLC ride. They were. We did. While we cycled the wife drove and drove (which was not her plan). 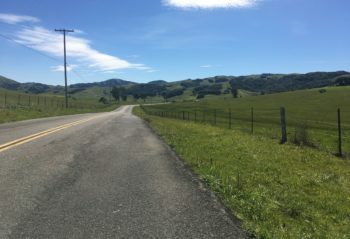 We managed to … Continue reading "CLC 2019 Ride 5: Monterey"
CLC 2019 Ride 4: What Is Art? April 14, 2019 A nice sunny day and we’re off to the Bay Trail where we haven’t ridden in several months. But first we make a sharp turn off the Permanente Creek bike path into the Googleplex. 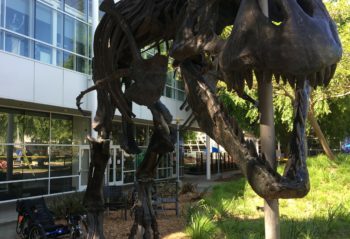 Not much happening in the main courtyard but we say hi to T-Rex. A while ago some wag … Continue reading "CLC 2019 Ride 4: What Is Art?" March 24, 2019 Last year I took a ramble that included the sweet-smelling apricot blossoms in the remnant orchards around this area. This year I wanted to get to the largest remaining local orchard that I know of on a property that happens to be owned by the Packard family. Because the blossoms were starting … Continue reading "CLC 2019 Ride 3: What Put the P in HP"
March 16, 2019 A short ride back in time today. The ride was short but the time was longer than I’ve been alive. 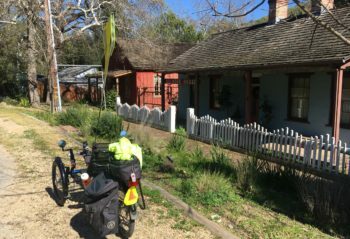 I rode to New Almaden, a small quicksilver mining village now subsumed by San Jose that is almost like going back to the 1800s if you squint well enough. 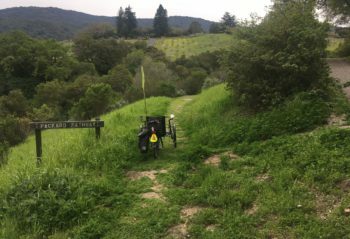 Fans of Wallace … Continue reading "CLC 2019 Ride 2: New Almaden"
March 14, 2019 The wife and I traveled to that tourist hotspot in Sonoma County known as Petaluma when we had a few days off. Why there? I have lots of rellies that live in Sonoma County, including lots of them in Petaluma, and we hadn’t seen them in a long time. Plus my sister … Continue reading "CLC 2019 Ride 1: Tomales, Chileno Valley, and Petaluuuuma"
Monday, November 12, 2018 / 2 miles So we end our coffeeneuring with a whimper in the smoke from a huge wildfire about 150 miles north of us. The weather patterns are not being kind to California this fall. We had a smitch of rain on October 1, and nothing in the immediate forecast. No … Continue reading "Coffeeneuring 2018 Ride 7: In the Big Smoke"
Monday, November 5, 2018 / 9 miles / This was a special day: I got to ride with Janet and Jack. We met somewhat in the middle at Wilder Ranch State Park. They drove up to the north end of Monterey Bay, I came over the hill from SF Bay. We had no particular agenda … Continue reading "Coffeeneuring 2018 Ride 6: Surf City"
Wednesday, October 31, 2018 / 16 miles / This was a spectacular day. The more I think back on it the happier it makes me feel. It involved some relaxation, the beach, redwoods, a resurrected cemetery, a big honkin hill, brussels sprouts, hot sun, deep shade, and tea. It had distinct sections that may have … Continue reading "Coffeeneuring 2018 Ride 5: Portals"
Tuesday, October 30, 2018 / 16 miles / By some miracle, four neighboring cities and a town on the San Francisco peninsula agreed on something. It’s called the Peninsula Bikeway, a designated route on surface streets connecting the cities and town. They even agreed on the signage. And even more of a miracle, the route … Continue reading "Coffeeneuring 2018 Ride 4: The Tao of Bike"
Monday, October 23, 2018 / 3 miles / Lovely day to drive about 15 minutes up the freeway to a bayside destination with the wife where she could stroll and I could roll and both end up at a cafe. That’s one good thing about the trike – you can go at walking speed without … Continue reading "Coffeeneuring 2018 Ride 3: Port o’ Call"
October 15, 2018 / 7 miles / … not to mention turkey cow deer pig. Saw them all today. Well, not the coyote. Or the bear. But I rode in Coyote Lake Harvey Bear Ranch County Park, which they refer to as Coyote Bear. I’ve been meaning to try riding at Coyote Bear for years. … Continue reading "Coffeeneuring 2018 Ride 2: Coyote Bear"
Sunday, October 14, 2018 / 10 miles / Ever see Charlie Chaplin in “The Tramp”? It was filmed in the little town of Niles, California in 1915. Niles was Hollywood before there was Hollywood thanks to Essanay Film Manufacturing Company opening an operation where the weather was more favorable than Chicago. Starting in 1912 lots … Continue reading "Coffeeneuring 2018 Ride 1: Queen of de Niles"
Sunday, April 15, 2018 6 miles The wife had a book to return to the library. I needed a little ride. So off I trundled to downtown Mountain View. It was a bit breezy but a beautiful day otherwise. Nothing but blue sky, like so: The weather forecast was for rain to come in around … Continue reading "CLC18 Ride 8: Many Happy Returns"
Tuesday, April 3, 2018 2.5 miles And now we get to the turf part of our day. After finishing my ride along Half Moon Bay, I drove about 20 miles south to the town of Pescadero. I’ve taken you here before in one of the BLCs I think. What I didn’t get to show before … Continue reading "CLC18 Ride 7: … and Turf"
Tuesday, April 3, 2018 10 miles I took today off just for me. I headed over to the coast to ride the along Half Moon Bay and its delightful Coastal Trail. I’ve shown it to you before, but like all special places it’s different every time. One thing I wanted to accomplish was to buy … Continue reading "CLC18 Ride 6: Surf and …"
Monday, April 2, 2018 9 miles Today’s support of the local economy was a visit to my chiropractor, whose office is in a business district of Palo Alto called California Avenue, or, Cal Ave. It’s a pretty easy, flat ride, and there’s lots of bike parking on the avenue. This chiropractor is new to me, … Continue reading "CLC18 Ride 5: Well-Adjusted on Cal Ave"
Sunday, April 1, 2018 8 miles Today was going to be a family day. A brother and his family were visiting from out of town, so those of us living out here on the Best Coast – three other siblings, mother, a cousin – were gathering for a late brunch. That meant I had the … Continue reading "CLC18 Ride 4: Course Change"
Saturday, March 10, 2018 6 miles Good morning and Happy CLC18! My first ride is my commute to work. I changed work sites about six months ago, and it’s a flat flat flat (except for a freeway overpass) five mile ride. I have to be at work early, and since October I’ve arrived at the … Continue reading "CLC18 Ride 1: Hi Ho, Hi Ho"